Samsung wanted to ensure the event was pure class and before the announcement, they gave the spectators in the giant blue hall a taste of orchestral music. The music was soothing no doubt, but it went for too long. As J.K Shin took the stage, he explained how consumers wanted simple durable design, powerful camera, faster and seamless connectivity and help them to stay fit before he unveiled the successor of the Galaxy S4, Samsung Galaxy S5. Months before the Galaxy S4 was released, we came across many leaked pictures and even an hands-on video of it which quite excited us to see what was really coming. We called the Galaxy S4, the S3 on steroids. Galaxy S4 was a huge jump from its predceessor which packed amazing features and most importantly, faster processor and an impressive camera. This time the Galaxy S5, in my opinion is just an upgrade of the Galaxy S4. Maybe call it, The Galaxy S4 Premium? Here’s a quick roundup of the specs. Samsung Galaxy S5 boasts a 5.1 Super AMOLED display with a 1920 x 1080 resolution and is just .1 inches larger than the S4. Since its display is larger than the previous, the pixel density has also been reduced to 442 ppi. It is armed with a Quad-Core Snapdragon 800 processor clocked at 2.5GHz and has a 2GB RAM on board. With a 16 Megapixel camera, the Galaxy S5 packs some more features than the previous S4. It comes with a fast Auto focus feature which is the first ever as it takes just 0.3 seconds to capture a fast moving object and with selective focus enabled, the pictures can have an end result similar to the picture output of DSLRs. At the rear, Samsung has added a heart sensor which will instantly measure the user’s heart rate if the finger is placed on it. Most importantly, the smartphone now integrated fingerprint scanner for better security and is dust and water resistant. That doesn’t mean it will keep working after you dip it in the water for 30 minutes. 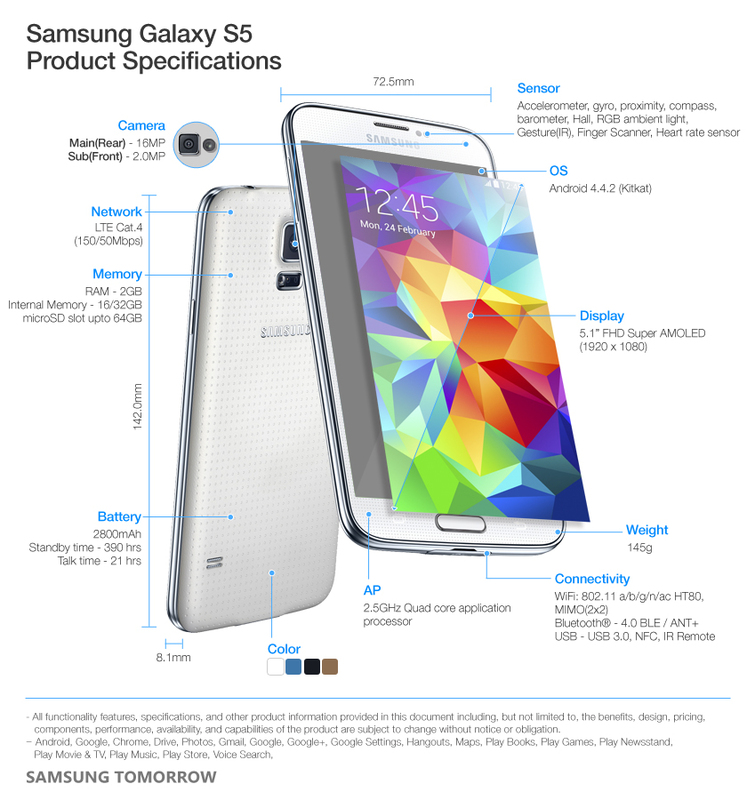 The Samsung Galaxy S5 isn’t a all new revolutionary smartphone that has brought a huge impact on the smartphone market. For the design part, there isn’t much to change and there is no need of expecting it to change because no matter what smartphones will be released, all of them would would somehow bear the same look. To me, the Galaxy S5 is a marriage between the Galaxy Note 3 and Galaxy S4. The round corners have been slightly reduced to make it look a bit squarish as we see in the Galaxy Note 3. One of the most important complaints that Samsung received on the Galaxy S4 is the rear design. The glossy plastic rear was simply a heaven for fingerprints and smudges. I have been using the S4 for about six months now and whenever I see the rear facing the top, there’s a sudden urge in me of simply abandoning the device. This time, the Galaxy S5 provides a solution by replacing the glossy plastic with a soft-touch finish similar to the one we see in the first generation Nexus 7. The Galaxy S5 can be a great smartphone if you love working out. Checking heart rates have never been so easy as all you need to do is place your finger on top of the LED flash and you receive the results instantly! For fitness, the S5 would work best if synced with the wearable gadgets such as the new Galaxy Gear Fit and Galaxy Gear 2 devices. The TouchWiz UI has also been changed and looks better than the S4 version as it comes with a different design and light colors. As Apple introduced the fingerprint scanner in the iPhone 5S, it was sure that if not any company but Samsung would follow. For the fingerptint scanner in the Galaxy S5, the finger has to be placed on the screen and not on the button. Samsung made sure this stayed different! Sony introduced the dust and water resistant feature on their Xperia smartphones, and now Samsung followed and have integrated this feature on theirs. There isn’t anything unique on the Galaxy S5 as it’s simply built on the existing Galaxy S4. For those who don’t own a Galaxy S4, the Galaxy S5 would be a great device for them but for those who do, it would be a foolish idea to shift. Personally, I was looking forward to procuring this device if it turned out to be a game changer but I might just stay with the S4 for a year and wait for the Galaxy S6! Overall, as a smartphone, there’s no complain in it being a great device packing new features and a faster processor with an impressive camera. It’s just that we expected the Galaxy S5 to thrash out all the existing smartphones in the market and would be the much-talked-about device in the market.